Lumos Global is the largest provider of off-grid solar in Nigeria, offering homes and small businesses a simple, affordable way to pay for solar energy in small instalments. The company is currently prioritising the marginalised Niger Delta region and partnering with the largest mobile network operator in the country to reach new customers rapidly. Nigeria is one of the largest economies in Sub-Saharan Africa yet approximately half the 186 million population lack any electricity. The national grid power, 85% based on fossil fuels, is notoriously unreliable so many people rely on small petrol generators or lead acid batteries as a back-up. There is a clear need for a clean, reliable and affordable energy service. The need is particularly acute around the Niger Delta, a poor region with a history of conflict around oil production and the lack of associated wealth dissemination, as well as a huge electricity deficit. It is a challenging area to work in and so has been overlooked by most off-grid energy service providers. Lumos was created to provide off-grid electricity in a sustainable and affordable way. It was one of the first companies to enter the Nigerian market with a Pay-As-You-Go (PAYG) business model for solar home systems (SHS). Nigeria, much like most African countries does not have an established mobile money platform so Lumos took an innovative payment and marketing approach. The company has partnered with MTN, Nigeria’s leading mobile network operator with a huge reach across the country, and pioneered the use of mobile telephone minutes as a currency for customer payments. Customers buy the SHS on a subscription basis and pay their subscriptions via their normal MTN mobile package. This has proved successful with rapid sales growth since Lumos launched a pilot in 2015. Since 2017 they have been successfully selling in the Niger Delta region in collaboration with All On Partnerships for Energy Access (‘All On’) and expanded into Côte d’Ivoire at the end of 2017. “Lumos’ business model and technology were designed from the start to be extremely attractive to a diversified universe of partners” said Ron Margalit, Principal for Impact and Blended Financing at Lumos. “Our ability to offer innovative ways to overcome some of the inherent challenges of the Pay-As-You-Go sector has proven time and time again to align with impact and commercial investors alike”. 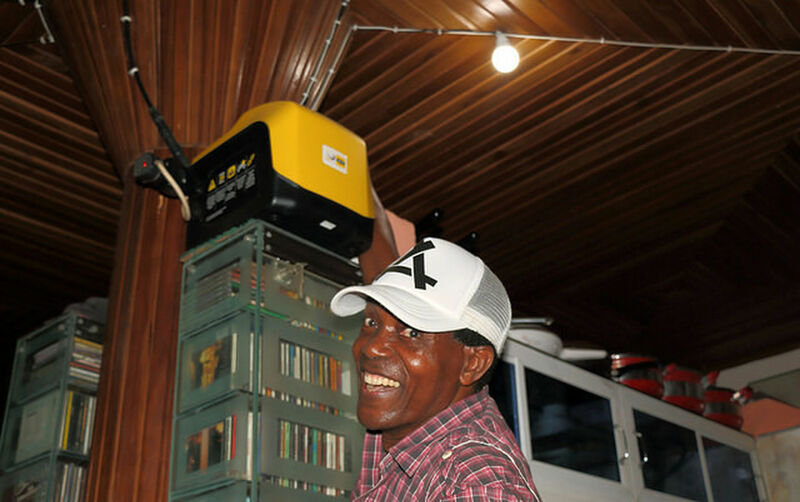 The Lumos offer is promoted and sold to customers in more than 300 MTN stores by specially trained MTN sales staff. Lumos provides the solar home system for a down payment and then charges a regular subscription for electricity for a period of up to five years, after which the ownership of the SHS transfers to the customer. A range of subscription packages are on offer with most customers opting for a $50 down-payment, followed by the 30-day pre-payment plan at approximately 50 cents per day. Together Lumos and MTN use TV and radio advertisements, billboards and social media to attract new customers. Lumos offers long-term warranties and customer support is provided by 24-hour MTN and Lumos call centres and network of local technicians. Over 88,000 solar home systems have been sold by Lumos at the time of winning the Ashden Award, including more than 5,000 systems in the Niger Delta region. About 75% of the customers are households in grid-connected urban areas and off-grid rural and peri-urban areas. The remainder are small and medium sized businesses and community buildings. In total, the systems are benefitting more than one million people. In total, the systems are benefitting more than 850,000 people. Customers previously relying on generators now benefit from significant financial savings, of around 60%, compared to their previous monthly fuel spend. Grid connected customers see improved power reliability with their Lumos system. Happy customer Schola Andem said: ‘‘It means a lot I can have power even when the grid is down. I can run the laptop and phone and TV and a couple of lights at the same time, without needing to run the generator’. Where customers are replacing kerosene lighting they now experience better lighting and reduced indoor air pollution and fire risks. The solar home systems also contribute to cutting greenhouse gas emissions with an estimated 34,000t of CO2. Lumos sets itself apart by offering large solar home system, capable of supporting businesses as well as households. The system was designed by Lumos in-house and is manufactured in China. Its ‘power station in a box’ is designed to be installed by the customer and includes an 80W solar panel, a 300 kWh battery, power sockets, inverter, two LED lights, a mobile phone charger and the associated electronics, boxing and cabling. It provides sufficient power to use two lights, the mobile charger and a 40” TV and fan simultaneously. Each system comes with a SIM card to allow remote communication and incorporates high levels of security to protect panel and battery to counter hacking and theft. Lumos has recently introduced a DC to AC invertor that allows customers to use the system with their existing appliances. The system has been certified by Lighting Global, an international quality standard on solar lighting. The market in Nigeria is enormous and there is demand for this type of service. Over the next three years Lumos is aiming to sell five million systems in Nigeria and to sell one million systems through expansion in other markets, notably in Côte d’Ivoire as well as Ethiopia and the Philippines. Lumos also plan to add additional services and to adapt for a range of different markets such as SMEs and the rural poor.